From File Explorer, drag and drop video or audio files right onto your Storyline. On the menu bar, click Insert, and then click the Suggested dropdown menu. Select your preferred content source, such as OneDrive, YouTube, or My device. Choose the video or audio file that you want, and then drag it onto your Storyline. Note: The content sources shown in this image are currently available for Microsoft Account (Hotmail, Live, Outlook.com) users. Sway content sources for Office 365 commercial users vary, and can be controlled by your organization’s IT administrator. In Storyline, click the + icon at the bottom of any existing card, select Media, and then choose Video, Audio, or Upload. Sway supports common video file formats, such as .mp4 and .mov, and common audio file formats, such as .mp3 and .wav. Learn more about file size limits. 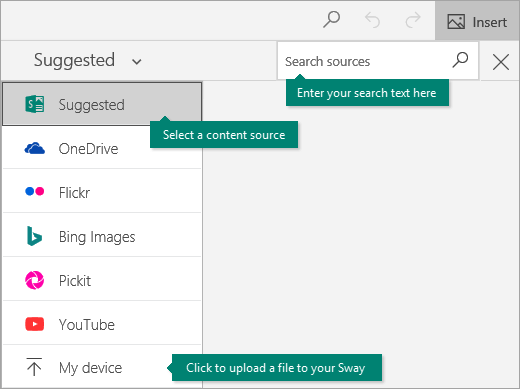 Want to embed video and audio files from third-party sources in your Sway? Learn how.